Learn how to address the key changes in ambulatory and outpatient care—from business rules, to patient mix, to competitor financials. The healthcare industry is making a transformative shift into the outpatient arena. According to a recent HealthLeaders Media Intelligence survey, healthcare leaders intend for 64% of their capital budget investments to go toward ambulatory or outpatient care expansion, and just 36% to inpatient acute care expansion. This collection compiles new strategies from organizations like Baptist Health and Geisinger Healthcare on how to address the key changes in ambulatory and outpatient care—from business rules, to patient mix, to competitor financials. 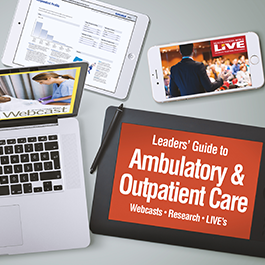 Leaders from New England Baptist Hospital share best practices around contemporary strategies for orthopedic success in the ambulatory environment. See how Geisinger Health System has improved care coordination and cut readmissions 36% through primary care team redesign and HIT-enabled population health. Ambulatory and outpatient care can be a great way to increase patient visits, grow market share, and generate substantial revenue—but only if you follow the industry’s direction of providing broader access, delivering care with greater efficiency, and treating patients as consumers. This report uncovers the strategies and tactics that can make it work for you. How was Jupiter Medical Center able to build an urgent care center, achieving double-digit revenue growth without cannibalizing business from its nearby medical center? Leaders from Baptist Health reveal how they are cultivating these roles at their organization, providing the skills training and staff structure to support new nurse leaders and translating that into improved metrics.